National Institutes of Health issued the following announcement on April 11. In a new study, researchers identified genetic subtypes of diffuse large B-cell lymphoma (DLBCL) that could help explain why some patients with the disease respond to treatment and others don’t. The study, led by researchers in the Center for Cancer Research (CCR) at the National Cancer Institute (NCI), part of the National Institutes of Health, with additional authors from several institutions around the world, was published online April 11, 2018, in The New England Journal of Medicine. DLBCL is the most common type of lymphoma. Although it can be aggressive, it is potentially curable, and in some patients treatment eliminates the disease. However, researchers still don’t have a full understanding of why some lymphomas of this type respond to treatment and others don’t. The standard treatment for the disease is a combination of chemotherapy drugs plus rituximab, a drug known as a monoclonal antibody. Several years ago, researchers defined two major subgroups of DLBCL that arise from different cells of origin and that have different patterns of gene activity. They found that patients with activated B-cell-like (ABC) DLBCL have about a 40 percent average survival rate, while those with germinal center B-cell-like (GCB) DLBCL have about a 75 percent average survival rate. But even in the GCB subgroup, many patients experience disease relapse after treatment. 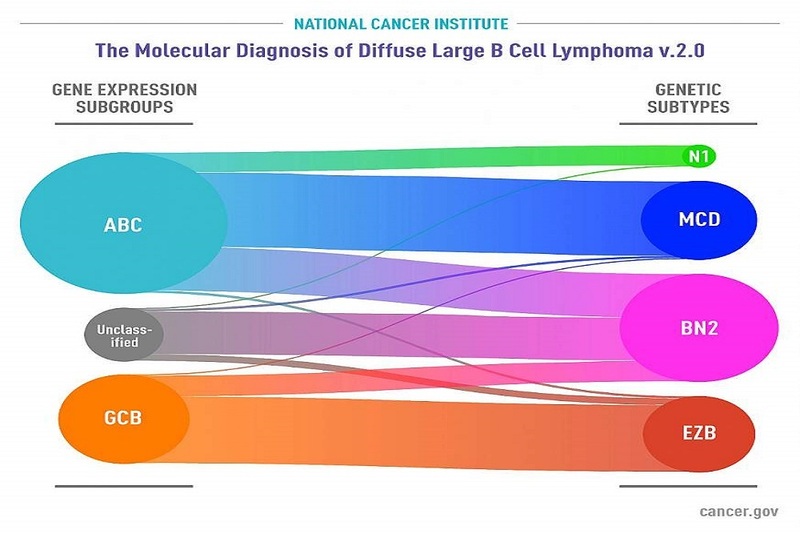 The investigators performed a multi-platform analysis of genomic alterations and gene expression on tumor samples from 574 patients with DLBCL. This analysis identified four prominent genetic subtypes that each share a group of genetic aberrations. Patients with two of the subtypes, called BN2 and EZB, respond well to treatment, while those with the other two, MCD and N1, do not. Some of these subtypes can be found in both ABC and GCB subgroups, so a patient could, for example, have ABC DLBCL, the gene expression profile with the lower survival rate, but the disease could also have the BN2 genetic subtype that responds well to chemotherapy. Data from the study will be shared through NCI’s Genomic Data Commons to make it available for future research. While the new findings relate to current treatment, Dr. Staudt said he and his colleagues hope the new molecular classification will be used in clinical trials, so, eventually, treatments can move away from chemotherapy as much as possible, toward more targeted therapies that have fewer side effects. Research is already being done in this area. Results of a phase 2 clinical trial published in 2015, for example, demonstrated that patients with ABC DLBCL were more likely to respond to the targeted therapy drug ibrutinib than those with GCB DLBCL. Precision medicine clinical trials could test tumors for the new genetic subtypes, Dr. Staudt explained, and then, based on the tumor’s classification, the patient would be assigned to the most appropriate treatment arm of the study.